I need a child's hand drawn concept turned into a professional looking graphic. 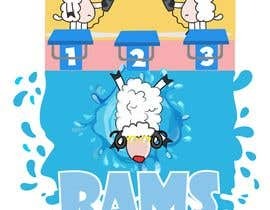 The attached drawing shows a ram diving off the starting blocks into a swimming pool. the blobs all over are supposed to be water splashing. 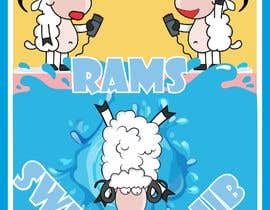 the two characters in the background are rams holding timer buttons. a picture of a real one of the buttons is attached as well for reference. 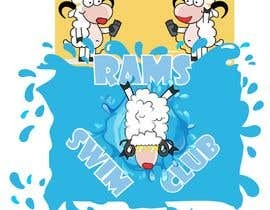 Please make sure that you have a starting block in your image that the ram is diving off of. 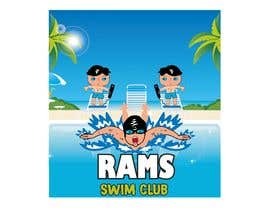 Also please ensure that the diving ram is wearing goggles. 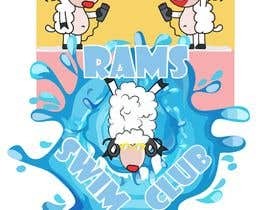 The graphic should have RAMS SWIM CLUB!!! in editable text at the bottom, you'll need to include the font in final product. The image should be fully editable vector. Last call for any late entries. If you've got something in the works, post what you've got and let me know what you're still working on. #22 , #23 , - looking great. thanks for all the hard work on these. ALL - I added a photo of a starting block. that's what i'm talking about. Also, you can take a look at #4. they added a starting block. I didn't like the design over all, but at least they got that right. Please make sure your design has this element. #18, going the wrong direction. honestly, if you go back to what you did in #10 , and then just add a the starting block like what you can see in the photo i attached to the project, that would be a great way to get you back on track. #14 , goggles better, water change not good. needs to still look like it's actually in a pool, so like lapping against the wall. my request for the splashes around the edge was that it should just be more random than previous version. #13 - looking for swim goggles, not mask and snorkel. also, still missing the starting block. thanks for the change with the border as requested, but can you make the splashes more random around the edges? #10 , #11 - can you take off the border, and have the edges of the water either fade or splash out to the side? 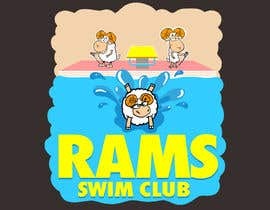 Please make sure that the diving ram has goggles on. #10 , #11 - going in the right direction as well. thanks for adding the pool deck/wall. Please reference the direction given to #5 below as well. Need to add a starting block. I would definitely like to see some more unique entries similar to what #5 provided. Can you draw the timer buttons, instead of using the included image? there should not be a mix of photo and drawn. 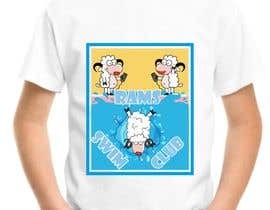 Need to make sure that the pool deck that the rams of the pool, and make the water look like it's going up to it. 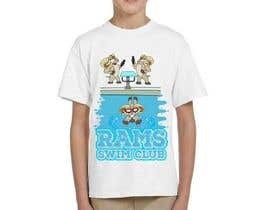 It's ok for it to look like splashes to the side of the shirt though like you have, but should look like the water goes up to the edge of the pool. Apologies for leaving out color details. I don't mind so much what colors in general as long as it looks good, but the team colors are black and athletic gold ( you can use #FFBF00 ). Those colors don't have to be included, and certainly don't have to be a part of the main design. If they are included, I would recommend perhaps the horns, or the team name. But again, the name should be editable text with the font included, and I can adjust that part later if needed. #4 - i like that you used the drawing as a concept and created something new. I don't like the look of the rams -- too rigid and identical. #1, #2, #7 - I'm not looking for this to be a simple digitization of the drawing, please treat the drawing as a concept to base the graphic on. #5 is going in the right directly, but not quite there yet.